Here’s a yummy stick to your ribs kinda soup recipe for this cold stormy spring day. Last time I posted it…was for a blizzard; today a Nor’easter. Make a big pot so you have leftovers for tomorrow…starting mine as soon as I finish posting this. Lentils are good for you and hearty in stew for chilly days. I took a basic Italian lentil soup and kicked it up a bit with some changes and additions. My daughter and I love the Italian sausage in it and I especially enjoy adding shredded kale to the mix. Kale is still very trendy these days but I have been using it for years; this is one of my favorite recipes to make with kale. It increases the nutritional value and the flavor of a soup. I also like how easily it goes together. If you hate kale leave it out; spinach is really tasty too in it. I prefer fresh kale, don’t forget to cut off the tough stems. In this batch I used a mixture of sweet Italian sausage and hot spicy sausage. Lots of extra flavor that way! This stew could be made vegetarian; use vegetable broth and leave out the sausage. I don’t always have the parm cheese on it but it is very tasty with it. 1-2 quarts chicken broth, If you don’t have that much broth just use water for part of it. 2 tbsp chopped parsley; can leave out if adding kale. Sauté the onion and carrots in the olive oil in a big heavy bottomed soup pot. I use a heavy bottom as your soup will be less likely to burn. Cook 4-5 minutes, stirring occasionally. Add the sausage; push the onions to the pan’s walls so they don’t burn. Cook for 3-4 minutes on each side. Add garlic and tomatoes and stir up well, add the tomato paste in water and cook 10 minutes. Add broth and season with salt and pepper; remove sausage to a plate to cool. Bring the soup back to a boil and then add lentils. Cook about 25 minutes, add the potatoes and cook 20 to 30 minutes until lentils are done to your taste, add the potatoes 20 minutes into the cooking time. Stir pot occasionally so it doesn’t stick. Add the kale and cook 5-7 minutes. While the lentils are cooking you should cut up the sausage into rounds and add back to the lentil stew when they are done. Let the soup stand at least 15-20 minutes once it is done. Serve in a wide soup bowl with a good sprinkling of grated Parmesan cheese on top. Perfect on a cold winter night to warm you up from your tummy to your toes! I am a true lover of seafood and enjoy a good soup. So, combining these two loves is a natural. Years ago I used to make French Bouillabaisse, a light seafood chowder served over garlic bread. The other day I was craving something warm and cozy like a bowl of soup. I had a can of artichoke bottoms someone gave to me. I had some seafood… I used to make a Portuguese seafood stew but I am kinda tired of that; so upon more thought I decided it would be far more interesting to make an Italian version of Bouillabaisse that could use the ingredients I had on hand including that can of artichoke bottoms. I had everything but the cod. It turned out pretty tasty. You can be flexible with the veggie amounts: I tend to use a lot of veggies in my recipes. I am positive you could use artichoke hearts, either canned or frozen in stead of the pricier bottoms. If you hate artichokes; leave them out. Their flavor is not a strong component but if you don’t want it…. A cup of thinly chopped fennel would make a good substitution. I got my saffron at Valley Farm Market in Bethlehem, cheapest around. Seems of good quality. Use what ever seafood you have or enjoy. I think it is more interesting if you use at least two sorts besides one white firm fleshed fish. Leave the clam or mussel shells in and ditto for the shrimp shells: they add real flavor and look very authentic, just let folks pick them out. Do not use large clams or big hunks of fish; no bigger than one inch square. Only cook it until shells open, shrimp curl and fish gets opaque. Heat EVOL in large heavy bottomed 2-3 qt sauce pan. Add celery, onion and carrots, cook about 5 minutes until softened, add garlic, cook another minute, add saffron, cook a minute. Add wine, water/whey and broth. Let heat a minute and add the potato cubes, bay leaf and red pepper flakes. Cook 15 minutes until potatoes are nearly done. Add cod which you have diced in large cubes and sprinkled with the lemon juice and mixed seafood. Cook about 5-8 minutes until seafood is just barely cooked. Serve over thick slices of French bread heated, smeared with butter and sprinkled with garlic powder. I used two per bowl. You can heat them in the oven or in a toaster; do not butter and put in toaster; If you use the toaster method you will have to butter and garlic after it is done. I tried it both ways and it is superior baked in oven but fine done quick in the toaster. I used leftover French bread I had made the other day, gluten free of course and it made great garlic bread. The garlic granules work well but if you feel compelled to use fresh garlic…. You pour the stew over the bread and let it get soft from the broth. Alternately you can just eat it as bread with your stew. Enjoy! Notes: I used chick peas I had cooked myself but canned are fine. If you don’t like chick peas use cannelloni beans or navy beans. I bet fava beans would be great in this! I used the whey remaining after I made Greek yogurt the day before. I never tasted it before; it is a touch salty and slightly tangy and very pleasant. 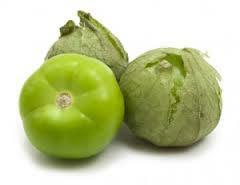 I believe it is full of nutrients and a great addition to a soup. Another stormy day! It’s time for another hearty one pot meal. This one is my multi-bean soup with Italian sausage. I started with a 1 lb 4 oz bag of 15 bean mix If you have celiac most 16 or 15 bean mixtures for soups contain barley which we are hugely allergic to. I found Hurts’s HamBeens 15 Bean Soup mix at Giant grocery store that was marked gf. I did not use the seasoning packet that came with it. Same brand I used last time. My soup has Italian sausage but you can leave that out if you want a vegetarian version. I personally love sausage in a bean stew. Gives you lots of meaty flavor and a healthy dose of protein. I am guessing you could use other things like smoky ham chunks or maybe a ham hock? I enjoyed a hot bowl of this pottage with a slice of toasted multigrain gf bread. It made a full meal without anything else being necessary. A fresh crunchy salad would go well if you want to round your dining experience out with some greens! Soak 1 pound 4 oz (typical bag size) of dried mixed beans in filtered water to cover. Soak it for an hour or try the overnight treatment. Bring to a boil and let stand an hour or just let stand in the cold water overnight. I did the quick version. Be sure to drain them well and rinse with sink sprayer before returning the swollen legumes to the carefully rinsed out pot. Cover with fresh filtered water and add a bay leaf. Cook 2 hours, pour in more water as needed and stir so it doesn’t stick or burn, cook another hour until the beans are nearly tender. It is hard to say when beans get done, depends on a number of factors, taste often to check for tenderness. And stir that pot! As they approach that almost done spot start the rest of the dish, get everything chopped up and ready to toss in when the beans have reached the two hour mark. Add the veggies to the pot, stir and cook 10 minutes. Stir occasionally. Add water if needed. I like the soup thick but it can’t be solid so add water. As that cooks, start the sausage. Sauté one lb Italian sausage: brown in a Teflon pan with a touch of olive oil until top and bottom are browned and sausage is mostly done. Let cool a bit and slice into rounds or chunks, set aside. Cook ten minutes, add more water if it gets too thick. Stir occasionally. Taste and add more spice if you think the soup needs more. Add the sliced sausage and cook five – ten minutes more. A total cooking time could be from 2.5-3 hours, depending on your beans. If they have been sitting in the pantry for many months they take longer to cook to a tender texture. Taste and add more salt/pepper as you see necessary. Let stand 5-10 minutes before ladling out. Now that is comfort food that is good for you too! Here’s a yummy stick to your ribs kinda soup recipe for this cold stormy winter day. Make a big pot so you have leftovers for tomorrow… Lentils are good for you and hearty in stew for chilly days. I took a basic Italian lentil soup and kicked it up a bit with some changes and additions. My daughter loves the Italian sausage in it and I love the kale added to the mix. Kale is very trendy these days but I have been using it for years; this is one of my favorite recipes to make with kale. It increases the nutritional value and the flavor of a soup. I also like how easily it goes together. If you hate kale leave it out; spinach is really tasty too in it. I prefer fresh kale, don’t forget to cut off any tough stems. In this batch I used a mixture of sweet Italian sausage and hot spicy sausage. Lots of extra flavor that way! 1-2 quarts chicken broth, I prefer Kitchen Basics. If you don’t have that much broth just use water for part of it. Sauté the onion in the olive oil in a big heavy bottomed soup pot. I use a heavy bottom as your soup will be less likely to burn. Cook 4-5 minutes, stirring occasionally. Add the sausage; push the onions to the pan’s walls so they don’t burn. Cook for 3-4 minutes on each side. 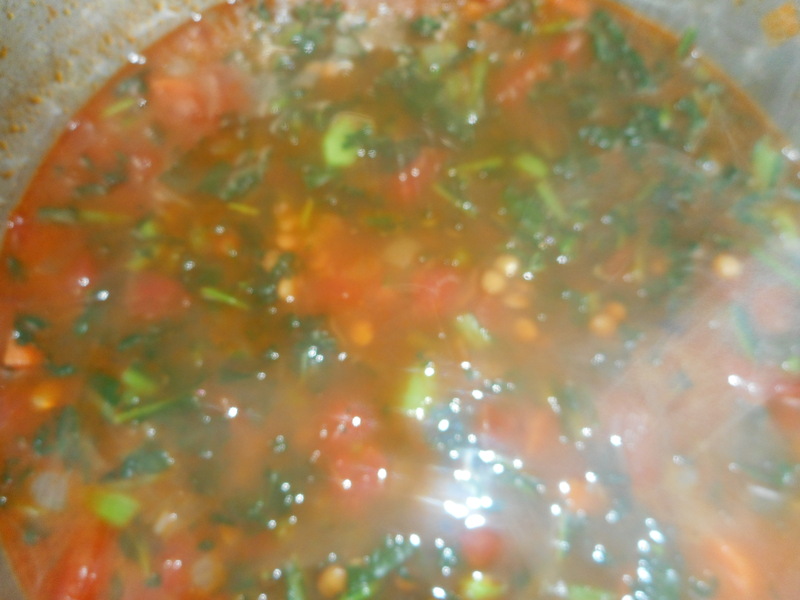 Add tomatoes and stir up well, add the tomato paste in water and cook 10 minutes. Add broth and season with salt and pepper; remove sausage to a plate to cool. Bring the soup back to a boil and then add lentils. Cook about 45 minutes to 50 until lentils are done to your taste, add the potatoes 20 minutes into the cooking time. Stir pot occasionally so it doesn’t stick. Add the kale and cook 5-7 minutes. While the lentils are cooking you should cut up the sausage into rounds and add back to the lentil stew when they are done. Let the soup stand at least 15-20 minutes once it is done. Serve in a wide soup bowl with a good sprinkling of grated parmesan cheese on top. Perfect on a cold winter night to warm you up from your tummy to your toes! Okay, I have one more yummy soup recipe for these cold winter days. I took a basic Italian lentil soup and kicked it up a bit with some changes and additions. My daughter loves the Italian sausage in it and I love kale added to the mix. Increases the nutritional value and the flavor. I also like how easily it goes together. Lentils are very earthy and very good for you. I have to say that my daughter loves this recipe; I made it because she was talking about it last week. Perfect to enjoy during this frigid weather. If you hate kale leave it out; fresh baby spinach might be tasty too in it. I like my kale fresh when making stews and I usually cut off any tough stems. This recipe is naturally gluten free. Do be careful about the broth you use. Make sure it is labeled gluten free. It could be made vegetarian; use vegetable broth and leave out the sausage. I don’t always have the parm cheese on it but it is very tasty with it. Sauté the onion and carrots in the olive oil in a big heavy bottomed soup pot. I use a heavy bottom as your soup will be less likely to burn. Cook 4-5 minutes, stirring occasionally. Add the sausage; push the onions to the pan’s walls so they don’t burn. Cook for 3-4 minutes on each side. Add the garlic as you are turning or stirring . Add tomatoes and stir up well, add the tomato paste in water and cook 10 minutes. 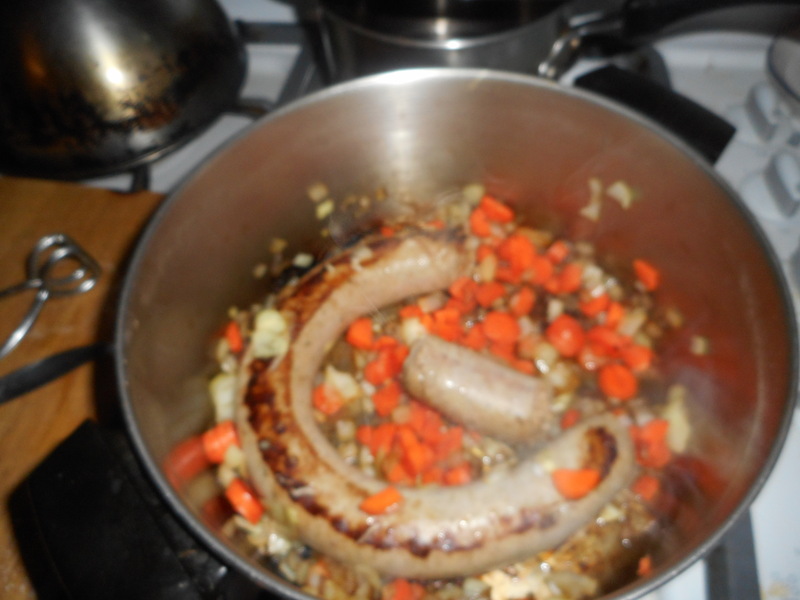 Add broth and season with salt and pepper; remove sausage to a plate to cool. Bring the soup back to a boil and then add lentils. Cook about 45 minutes to 50 until lentils are done to your taste. Stir it occasionally so it doesn’t stick. Add the kale and cook 5-7 minutes then add back the sausage. While the lentils are cooking you should cut up the sausage into rounds and add them to the stew when the lentils are done. Let the soup stand at least 15-20 minutes once it is done. Serve in a wide soup bowl with a good sprinkling of grated parmesan cheese on top. Perfect on a cold winter night to warm you up from your tummy to your toes! I only made a half batch this time as that was all the lentils in the house. We ate it all up before realizing I had forgotten to take a picture of a bowl of hot soup, ready to dive my spoon into it’s tasty depths. Next batch!